What Justice is to be found in the passionate rejection of the process for attaining Justice? 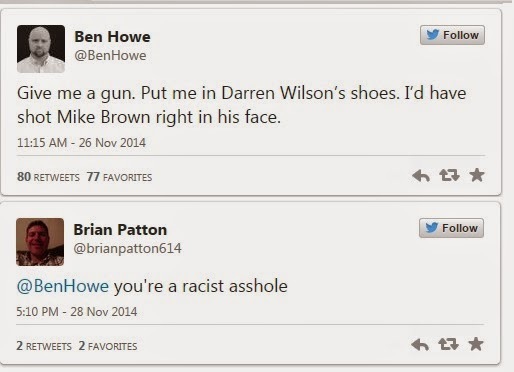 RedState’s Ben Howe has been catching some flack for his tweets on the #Ferguson issue, which he’s ably summed up in an article entitled: “Why I Said I’d Have Shot Michael Brown in the Face“. If you find that too provocative of a title, you should read it yourself, he defends his position well and needs no help from me. But if you’ve got a moment, I’d like to ask you a couple questions myself. It won’t take long. Do you believe that Justice is something most likely to be attained by a methodical presentation of evidence and deliberated upon by a disinterested jury of peers? Or do you think that ‘justice’ is what the more vocal and passionate demand as satisfaction, and which everyone else must be compelled to agree with as well? If you believe that the Judicial process is a Just process – not an infallible guarantee of determining THE Truth of what happened – but as being the most just process, the path most likely to achieve a reasonable and justifiable conclusion about what may not ever truly be known; if so then you’ll have to concede that the decision of a jury of 12 citizens, who, after hearing extensive testimony, considering evidence, deliberating carefully upon it, concluded that Officer Wilson’s shooting of Michael Brown was not an unreasonable action. Not because he one was a policemen, and not because of the race of the dead person, but because that that was the conclusion most supportable by the facts. If, on the other hand, you believe that the demands of the more vocally aggrieved are what society must appease, if you believe that those who are so sure that they know best, should have the power to punish those who disagree with them, if you believe that the passionate certainty of some confers upon them the ability to Just KNOW what other mere mortals can have no direct knowledge of; if you believe that intimidation and the threat of violence, actual violence, assault, arson, destruction of property and the violation of everyone’s individual rights are justifiable because a few claim to know best and that everyone else must agree with them or else be subjected to invective and cast out… then you will conclude that ‘Justice’ can only be served by those who agree with you, and that those who disagree with you must suffer the consequences of their opinions. If you align yourself with the second, congratulations – you are fascist fodder and your time, your rise, and your fall, is coming. If you align yourself the the first, but quietly allow the second to parade on by without speaking up, then congratulations – you will be the first to be consumed by the second group. If, on the other hand, you are one of the few who have bothered to learn the lessons of history, but are living in a society where such lessons were discarded from the educational system a century ago – then congratulations and pull up a seat, for we are very likely going to be stuck living through the lessons of history that everyone else seems so intent upon dooming us all to repeating. TMI Department: The National Enquirer (which first broke the John Edwards story) quotes an Arkansas state trooper on then-Gov. Clinton’s security detail. It’s not an image I want before dinner. Maybe it will help me lose weight! What happens early will probably foretell results for the rest of the night. Here’s a full list of when the polls close in each state.